Poppy Pour-Over Coffee Machine by Quirky. 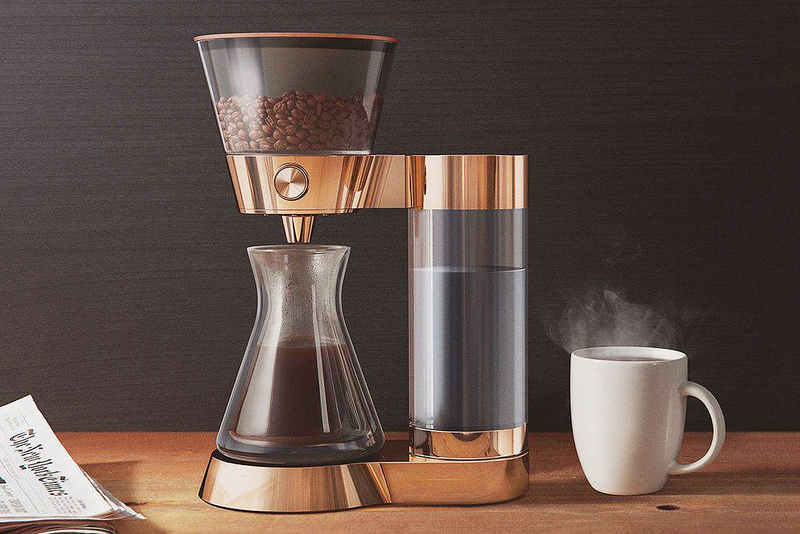 The Poppy Pour-Over by New York-based Quirky is an impressive looking web enabled coffee machine with impressive technical features. 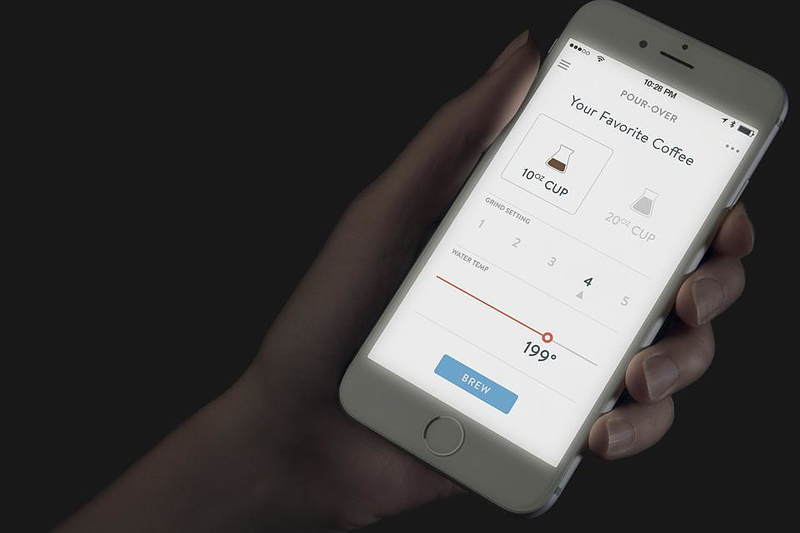 It can be controlled from an iPhone app, which lets you not only customize your next cup of coffee, but also automatically orders more coffee when it detects you’re running out of beans. As long as you got an internet connection and the app installed, you can ask Poppy Pour-Over to get a cup of coffee ready for you when you get home, or when you finish going through mail in the living room! 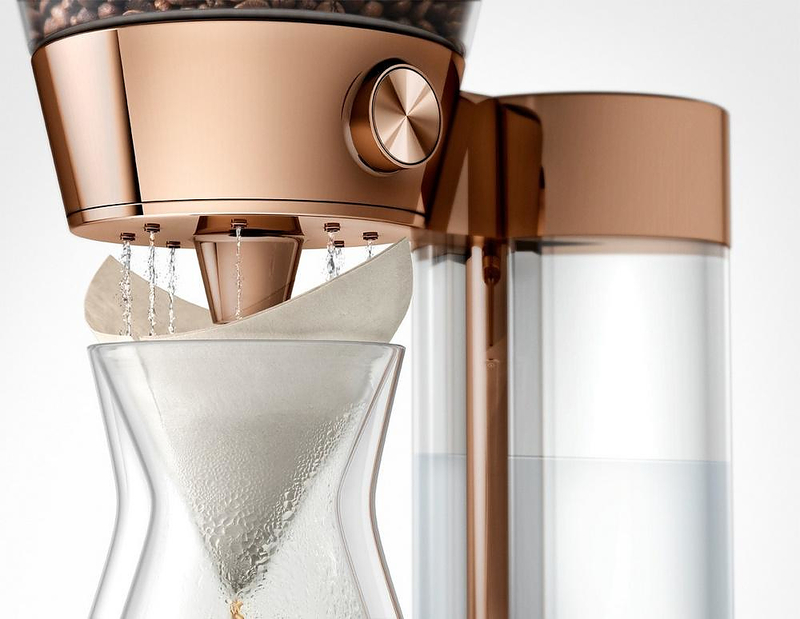 The appliance will brew a cup of coffee from start-to-finish, which means that users don’t even have to grind the beans. 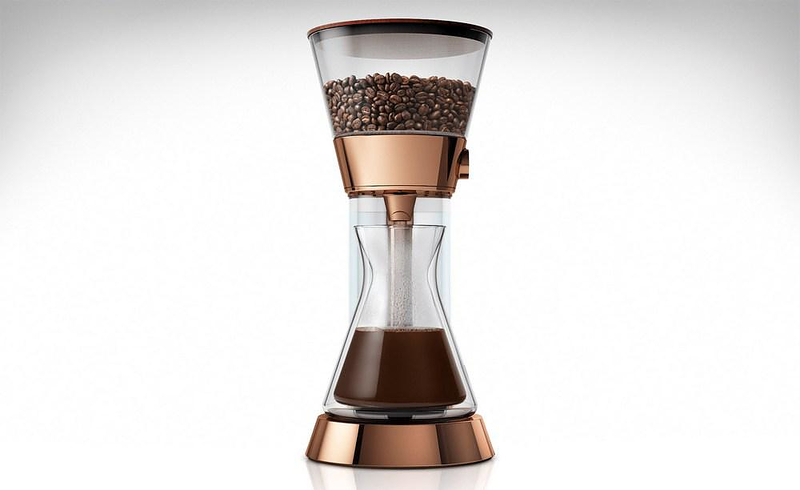 The Pour-Over Coffee Machine can brew two portions of coffee, 10 or 20-ounce servings, in its double-walled glass carafe. 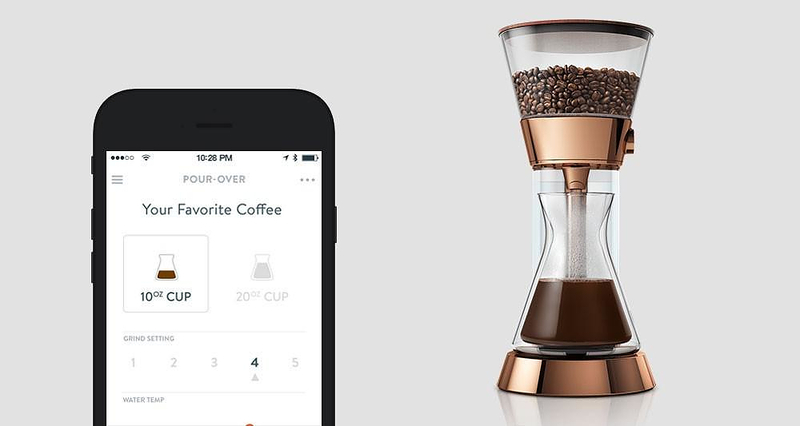 Using the Wink app, you will be able to set, and save for later use, the grind size, water temperature and other characteristics of your coffee, directly from your iPhone. What really sets the Poppy Pour-Over Coffee Machine apart from other web-enabled coffee makers is that it will be one of the first products to ship with Amazon’s new Dash Replenishment Service, which allows customers to “replenish frequently ordered products with a push of a button.” The Poppy Pour-Over keeps track of the user’s inventory of remaining coffee beans and filters. So if you are running low on either, the machine will place an order with the Amazon Dash account set up beforehand. 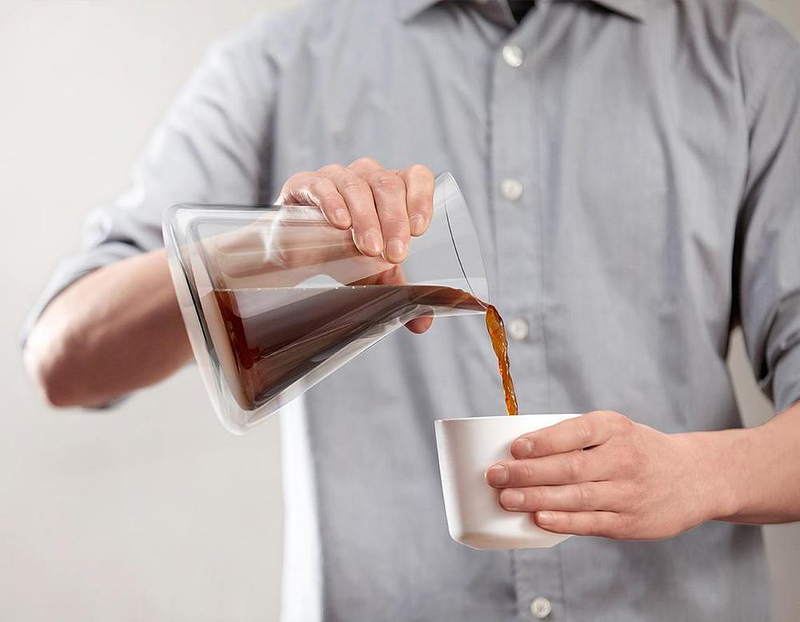 The Poppy Pour-Over features a hopper that can store up to 1.25 pounds of coffee beans, a water reservoir that holds enough for 4 servings, a built-in charcoal water filter and a double-walled glass carafe. Finally, the Pour-Over works with regular paper coffee filters. Unfortunately, pricing details for the Poppy Pour-Over are not available at this time, but the coffee machine should be released in late 2015.